Sleep tight, strawberries and lettuce. Despite the warmer than normal temperatures we were experiencing in March, there had to be backlash. It's been the month of April, where plants that are already three weeks ahead of schedule are rolling the dice with the temperatures. We're in the midst of a three-day freeze warning (yet again), after last week finally brought much needed rain (over an inch I believe). 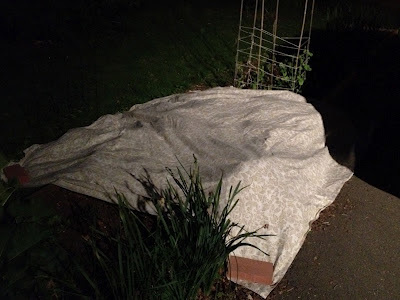 Last night it didn't drop as low as they predicted in my part of town, but I've been out covering the greenhouse that holds agertums, dahlias and petunias with an old sheet, as well as the strawberry patch which is blooming like crazy. This is suppose to be our average last week of frost. At the end of the week, we're suppose to be having temperatures in the high 70s yet again. Where has April gone?